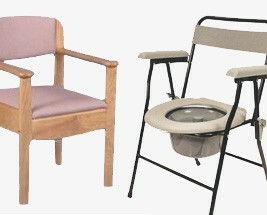 Our range of commodes offers fantastic versatility, convenience, value and style, providing alternative toilet facilities and a valuable aid to the disabled or those with restricted mobility problems. This range features products that meet a wide variety of requirements including; folding commodes for easy storage, wheeled commodes for increased flexibility and stylish wicker commodes which are suitable for use as attractive household furniture. If you are looking for something smaller and portable, why not browse our range of Bed Pans and Urinals.